Jonzi D is the founder and Artistic Director of Jonzi D Projects and Breakin' Convention. A dancer, spoken word artist and director, he is the foremost advocate for hip-hop theatre. 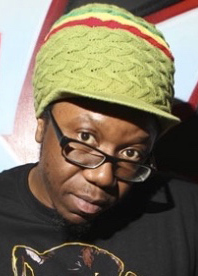 He has been an influential force in the development of the UK British hip-hop dance and theatre scene over the last two decades. Breaking convention tours all over the world under his leadership.